The gate on the Volterra road was built on the site of the Porta Selva, which was destroyed by troops allied to the Siennese during the siege of 1479. At the time, the bastions and the battlements were already present, while the gateway as it appears today, giving access to the Borgo di Santa Caterina, was built together with the new outer walls by the Florentine architects Cecca, Francione and Giuliano da San Gallo. The Porta Nuova ('New Gate') opens onto Via Gracco del Secco, the main road in the old borgo, which is bordered by large residential palazzi. Their yellow plaster facades are in the late 18 C style and were added by Pietro Leopoldo di Toscana. Opposite one another are the hospital of San Lorenzo and the San Pietro conservatoire, with its adjacent church. Both of these buildings were built by the powerful Usimbardi family, to which the first Bishop of Colle di Val d'Elsa belonged. In mediaeval times, to pilgrims travelling along the road from Volterra to Colle di Val d'Elsa, the sight of the majestic and impressive Porta Nuova, with its large, round bastions, must certainly have been striking in its monumentality, as an emblem of the town’s beauty and importance. The monument represented the central role played by Colle di Val d'Elsa in the war between Florence, with its dependent territories, and the city of Sienna. The hospital of San Lorenzo, built in 1635, bears clear signs of Leopoldo’s extension, and was carried out by Bernardino Fantastici, whereas the San Pietro conservatoire, which was completed in 1606 to plans by Giorgio Vasari the Younger, was originally home to lay sisters of the Augustinian order, and was later a home for young girls. It is now the Civic and Diocese Museum of Religious Art. One of the Museum’s masterpieces is the Maestà by the Badia a Isola Master, painted in the style of Duccio. The collection also boasts a rare eucharistic set dating to the 6 C and a wooden crucifix by Marco Romano, as well as a large group of works of art ranging from the mediaeval period to the 20 C.
The Borgo of Santa Caterina is the location of the former homes of numerous merchants dating back to the 13 C and 16 C, in which one can still detect the original shape of the towers, and from Piazza Baios one can admire the towered structures of the medieval buildings in Via dell'Amore and Via del Refe Nero. The only surviving part of the old Porta Vecchia (demolished in 1764) is the imposing Renaissance bastion which was used as a water cistern, and from which the network of the town’s water conduits used to lead, supplying fresh water to the Mercatalis Fountain, situated in Piazza Santa Caterina. Continuing down the road, one comes to the 15 C Church of Santa Caterina d'Alessandria, adjacent to which are the Oratorio dei Filippini and the Oratorio della Compagnia dalle Croce, where can still find the early 16 C terracotta group showing the Lament Over the Body of Christ, attributed to Zaccaria Zacchi. The square opposite the house identified as that of the humanist and Lutheran theologian Aonio Paleario, who was burnt at the stake in 1570 in Rome, offers a welcome spot where one can relax in the shade of the trees and admire the attractive countryside of the Tuscan hills, and a fine view of the Church of San Francesco, one of the first sites of the Franciscan Order in Tuscany (1229). Church of San Francesco, which stands alone atop the hill opposite the Castello district, is reached by crossing a 14 C arched bridge, which was built to join the monastery to the Borgo of Santa Caterina. In the church, which is late Romanesque, hidden beneath 17 C overpainting and stucco-work, one can see paintings spanning the period from the 13 C to the 15 C, including work by two local artists from Colle Val d'Elsa, Giovan Battista Tolosani and Cennino Cennini, the famous author of the Libro dell'Arte (Book of Art). In the cloister one can still find remains of frescoes and various preparatory drawings for frescoes by painters from the school of Duccio di Boninsegna. From Piazza Santa Caterina, continuing along the main road flanked by aristocratic palazzi, one reaches Palazzo Renieri-Portigiani, currently the home of the Palazzo Comunale (Town Hall) with its facade of ashlar masonry and a huge crest of the Medici family. The palazzo was built at the request of Bernardino Renieri, who held the post of engineer at the French court of Charles IX, and who was appointed "Guelfa architect" in the service of Francesco I de' Medici. Dated to between 1575-1580, the building is stylistically similar to the palazzi designed in the Florentine 'manner' by Bartolomeo Ammannati, and is marked by the two-tone use of colour based on terracotta tiles and travertine. The Campana bridge stands next to the Town Hall and joins the Borgo and the Castello districts, giving access to the town centre. 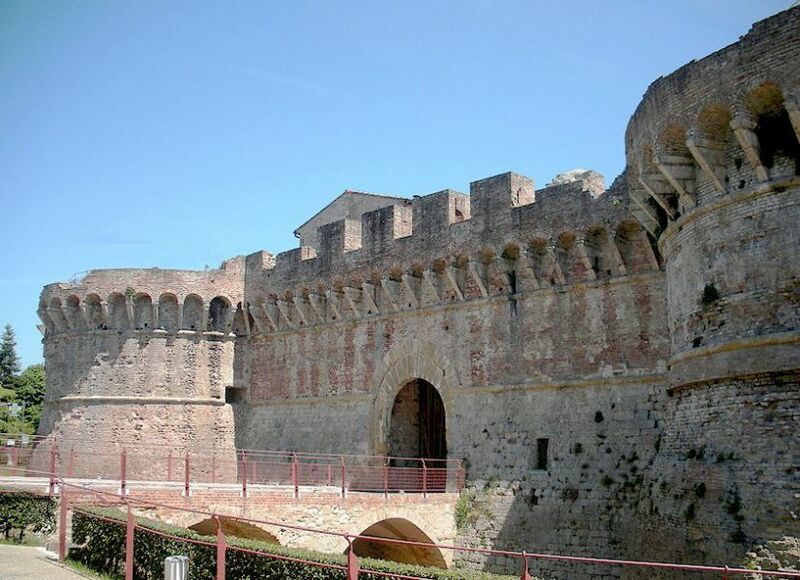 Today, the difference in ground level, which provided the town with a natural means of defense, is spanned by an impressive brick-built arched ramp, forming an introduction to the architectural scenario of the Palazzo Campana. The latter was built on the site of the mediaeval Porta a Ripa, between 1539 and 1550, on the orders of Francesco Campana, secretary to Alessandro and Cosimo dei Medici, based on plans by Florentine architect Giuliano di Baccio d'Agnolo, known as Il Baglione. 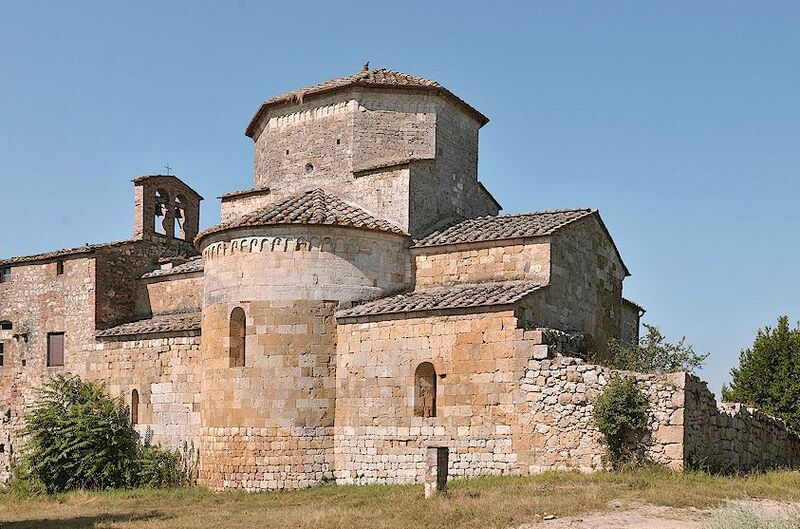 The Abbazia di Santa Maria Assunta a Conèo is a Romanesque structure that was founded by the Vallombrosan monks at the start of the 12 C and is one of the most interesting examples of religious architecture near Colle Val d'Elsa. Its plan is in the shape of the Latin cross, as is typical of Vallombrosan churches, and the intersection of the nave and the transept is surmounted by a sectioned dome, which is octagonal inside. The internal capitals and the cornice which runs round the outside of the building are decorated with starred flowers and other geometrical devices, of great artistic beauty. The building possesses a number of pre-Romanesque features, with numerous external brackets in the shape of imaginary animals. 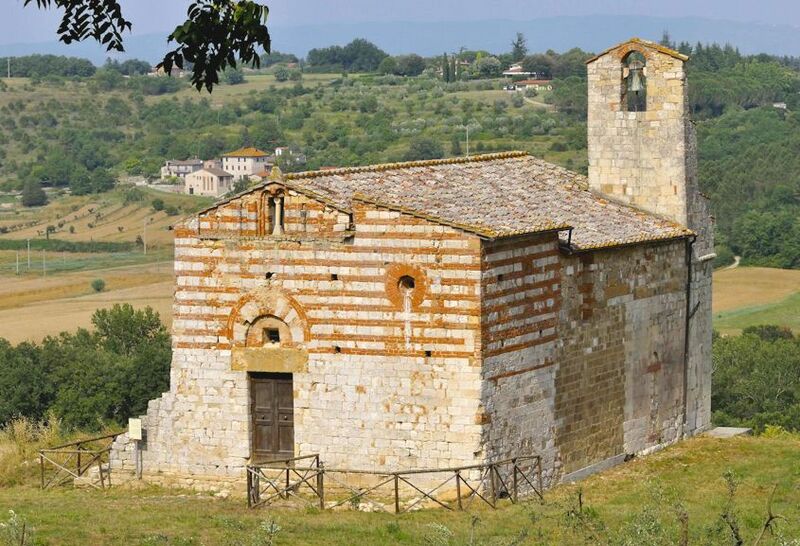 The parish church of Saints Ippolito e Cassiano existed as far back as the 10 C and was later part of the bishopric of Volterra, while towards the end of the 12 C it came into the sphere of political influence of the municipality of Colle Val d'Elsa. From that time on, it did not flourish particularly, possibly due to a descrease in the local population. Whatever the explanation, as early as 1413 it was found to be largely in ruins. It met a similar fate during the 17 C, when it belonged to members of the Picchena family. Originally, the church had a basilica-like structure with an apse and a wooden roof. The building which we see today, however, is the product of various renovations in the mediaeval period and work on it during the Romanesque period seems to have lasted for over 50 years: from the end of the 12 C until the middle of the 13 C.